Happy first day of winter! We’ve had mild weather in central Pennsylvania so far, but it’s time to start thinking about cold weather safety for our dogs. Here are 6 tips for having a safe winter with your dog. Supervise your dog around fireplaces. If you love a toasty fire on a cold winter day, be sure to supervise your dog around the fireplace. Use a screen to protect your dog from flames and soot. Don’t leave your dog alone in the car. In cold weather, cars can act as giant refrigerators, and it can quickly become dangerous for dogs. If you’re running errands or traveling, and you think you might not be able to take your dog inside with you, it might be better to leave them at home. Watch for frostbite. Dogs can get frostbite, too. Watch for red, gray, blue, or whitish areas on the nose, ears, and feet. Dogs may have fur coats, but if it’s cold enough that you want to go back inside, it’s probably time for your dog to come in, too. And remember, puppies don’t tolerate the cold as well as adult dogs do. Be prepared for winter storms. 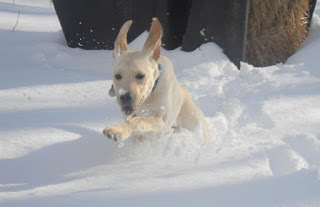 If a winter storm is predicted, make sure you have enough dog food, fresh water, warm bedding, and any meds your dog is taking in case you get snowed in. Wear collars and ID tags outside. Dogs can easily lose their scent in the snow and ice and may not be able to find their way home if they get away. Every time you take your dog outside, whether it’s on a leash or just in your backyard, make sure your dog is wearing a collar and ID tags. Wipe dog’s paws, legs, and stomach. After spending time outside in the sleet, snow, and ice, please remember to wipe your dog’s paws, legs, and stomach. This will remove harmful chemicals, like antifreeze and salt. Also be sure to check between your dog’s paw pads for ice balls and remove them. If you have any other tips, leave them in the comments. Have a safe and happy winter! All of our puppies are now with their puppy raisers, which means it's time to start learning how to be service dogs! For the first 9 weeks with their puppy raisers, our puppies attend early socialization classes with the other dogs in their litter. During these classes, we introduce and practice new some basic skills that the dogs should know, such as "sit," "down," and loose leash walking. These classes lay a solid skill foundation for the puppies before they move into regular puppy classes with the rest of our dogs in training. And as the name suggests, they also give the dogs a chance to be socialized. 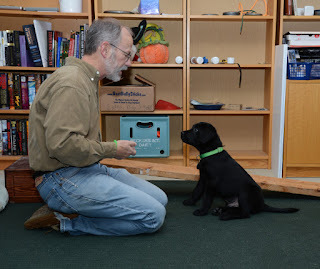 In Tuesday's early socialization class, the Water puppies practiced "sit," and then started working on "down." To teach "down," we start the dogs in a sit, then with a food lure, move our hand from the dog's nose to the floor. As soon as the dog is lying on the ground, we click and give the dog the treat. We'll use a lure up to three times, and then we'll just use our hand, still clicking and treating when the dog is lying down. At this stage, it's important not to use the word "down." The verbal cue will be added later, once the dog is reliably lying down. Soon, the Water pups were doing beautiful "downs!" We also practiced loose leash walking, which is one of our most important service dog skills. It's one of the hardest skills for a dog to learn because it involves so much self control. It's also a skill that needs to be taught from day one so the dogs learn never to pull. The Water puppies are off to a great start! We also continued working on the cue "go to bed," where the dog goes to a mat or dog bed and lays down. This cue can be used as a great anchor for the dog, and it has many uses. It can be used to give the dog a place to be while their handler is preparing food in the kitchen, or it can be used as an anchor when guests visit, among other things. To teach this cue, we put a towel or blanket on the floor and start by clicking and treating the dog just for looking at the blanket. Once the dog has that down, we wait to click until the dog takes a step toward the blanket, then two steps, then three, until the dog has all four paws on the blanket. We keep increasing the criteria until the dog goes to the blanket, lays down, and stays there. Once the dog has that behavior, then we'll add the verbal cue "go to bed." Watch SSD Cove practice "go to bed." She walks right over to the towel and puts all four paws on it. Notice how her puppy raiser delivers treats so Cove has to step off of the towel. This sets it up nicely so that Cove has to keep moving and walk back to the towel for another click and treat. We're looking forward to seeing what these puppies learn by next week! What happens when someone knocks on your door or when someone walks up to greet your dog? Does your dog jump? Or do they keep all four paws on the floor? We expect our service dogs to keep all four paws on the floor. They must never greet people by jumping on them. It’s very important to never reinforce jumping, especially when they’re puppies. It might be cute when a tiny puppy puts its paws on your legs, but it won’t be nearly as cute when that puppy becomes an 85 pound dog and jumps on you. It could even be dangerous. The general public can make it difficult to teach dogs to keep all four paws on the floor. Some people like when dogs jump on them, and they may reinforce it by petting the dog or talking to it when it jumps on them. If you see your dog getting too excited, you can always walk away and not allow other people to greet the dog until it’s calm. When your dog tries to jump on you, you can either turn your back or you can walk through them. When you walk through them, the dog will back up, which means all four paws will be on the floor. Puppies will sometimes tumble over backwards. Once the dog has all four paws on the floor and keeps them there, you can give it attention. If you have a puppy, you can discourage jumping by squatting to pet it rather than bending over. Bending over can inadvertently encourage jumping. When you have guests or when people ask to pet your dog, make sure to tell them that they can only pay attention to your dog if it keeps its paws on the ground. Getting your guests to help you train this behavior will make it much easier. 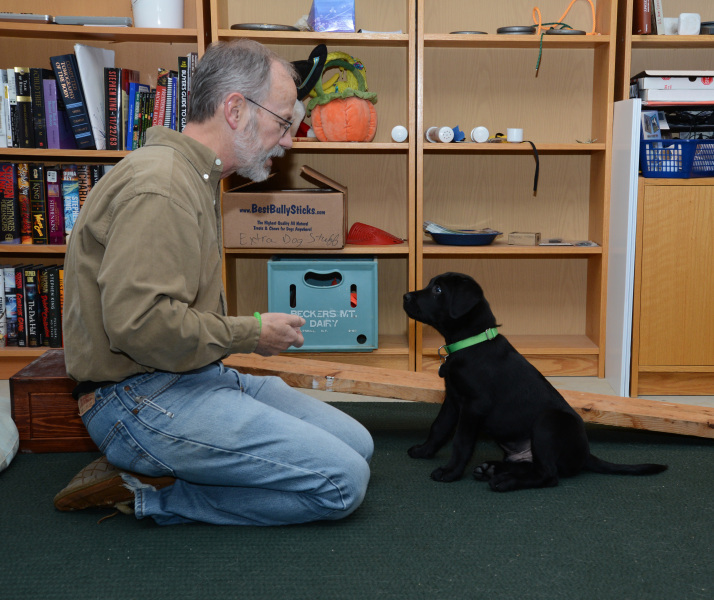 House manners are one of the most important things our puppy raisers teach our dogs. When a dog has good house manners, they have many more options for where they can be placed. 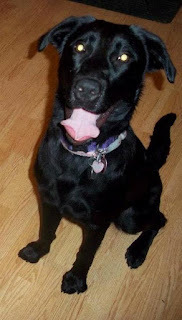 Poor house manners, on the other hand, can get a dog completely discharged from our program. Although our trainers see the dogs in puppy classes and outings and work with the dogs in advanced training, they don’t often get to the see the dogs at home. That’s why it’s so important for our puppy raisers to teach good house manners. What traits are we ultimately looking for in our service dogs? Adaptable. Our service dogs must be adaptable. We’re looking for dogs that can easily relax in almost any situation or environment. Confident. Service dogs need to have enough confidence that they don’t get scared by adaptive equipment, a person who walks with a different gait, or even someone wearing a sweatshirt with the hood up. Their future partners may use crutches or an adaptive communication device, and the dogs must have the confidence to perform their tasks and behaviors. Friendly. We’re looking for dogs that are friendly and like people and other animals, but we don’t want dogs that are unusually friendly. A dog that gets so excited to greet people that it jumps up or pulls away from its partner may not be a successful service dog. Easy to live with. The purpose of a service dog is to make its partner’s life easier and give the person more independence. The partner shouldn’t have to adapt their life to the dogs’ needs. Rather, the dog should fit almost seamlessly into its partner’s life. “Easy to live with” means the dog is housebroken, potties on cue on and off leash, stays off furniture and the bed, is quiet, waits at doors, saves rough dog play for outside, can stay at home alone uncrated for at least two hours, and lives nicely with dogs and cats. Polite. Finally, our dogs must be polite, meaning they respect people’s belongings and their space. For example, the dog shouldn’t chew its partner’s shoes or couch. Teaching good house manners starts from day one. Practiced behaviors become learned behaviors. If you start right away and you’re consistent, your dog will most likely learn lovely house manners. Try to use great management and clicker training to only teach good behaviors, but it a behavior does slip through the cracks, such as countersurfing, fix it right away. Don’t just ignore the behavior and hope it goes away. If you need to address a behavior, use appropriate punishment for inappropriate behaviors. For example, if a dog jumps on the couch without permission, simply use its collar to guide the dog off. Once the dog has all four paws on the floor, you can invite the dog back on the couch if they ask politely. Asking politely can be sitting or resting its head on the couch or in your lap. You can then choose to invite the dog up on the couch. Please note that SSD does not approve of painful punishment or anything more than a mild verbal correction or mild physical pressure, such as guiding the dog by the collar or moving into the dog’s space. Over the next few weeks, we will post our expectations for different behaviors around the house, as well as some tips for training them. Although these expectations and tips apply to our service dogs and are often stricter than the expectations for pets, these tips may also come in handy for training your pets. Visit us again next week for tips on training your dog not to jump on people. This could be especially handy if you’re planning to have guests over for the holidays!